This was a solo catch for Gilbert Hun with a fight time of 10 hours. About 8 hours into the fight, Victor Rapoza dropped off Bubba Kalama to help Gilbert handline the monster fish. 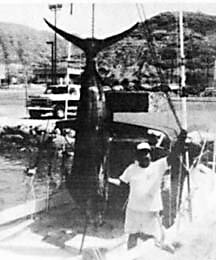 They arrived at the dock around 10 p.m. and found the scale batteries were dead so this weight was reached using the commonly accepted method of calculating marlin weight.